A common theme that a couple of the religious critics of the Everyone Wins Peace Plan have expressed is that peace plans to the right of my plan follow Halacha (Talmudic Law) and mine does not in relation to not allowing gentiles to have dominion in the Holy Land. Here is where they are mistaken according to my understanding of Talmudic Law. Are Arabs allowed to be accepted in the Holy Land by the Jewish people? 1) The Biblical injunction against allowing idolators to possess the Holy Land (Lo Techanem) only applies to adding groups and entire populations to the land, not individuals. (for more on this study tractate Avodah Zarah, Mishnah 1:8 and the Gamora 21a) So, for example, to bring this back to current events, the concept of an Arabic "right of return" to the Land of Israel would not be acceptable under this concept. Saving Lives (pikuach nefesh) is the more pressing concern, however, as Security realities preclude an Arabic "right of return" therefore the Arabic "right of return" is forbidden due to clear cut danger to life concerns and thus the prohibition is even more severe than the concept of Lo Techanem alone would prohibit and is absolutely forbidden under Biblical injunction. 2) Maintaining current demographic ratios via a staggered naturalization process connected to Jewish immigration rates (i.e. the heart of the Everyone Wins Peace Plan) would not be Biblically prohibited. 3) Any rabbinical restrictions that would be glossed over, due to the fact of the realities on the ground, and the probable leadership of a secular government in this process cannot override the fundamental command of preservation of life. Every day that true peace is delayed more lives are at risk. It would be a violation of Biblical law to even consider delaying a TRUE peace plan. Moshiach (the Messiah) could come up with a better plan, I admit. But we are prohibited to wait until he comes for such an optimal plan due to the danger of life that would entail (unless he should show up before you finish reading this...). Since that is the case, we must run with whatever peace plan that is politically VIABLE within the context of allowing for primal halachic standards. Rabbi Kahane's plan, unfortunately, does not meet that test. Of the currently well known peace plans, Everyone Wins allows for primal halachic standards, while showing the most concern for the indigenous Arabic population (as well as the indigenous Jewish Population) of any halachically acceptable plan. This makes Everyone Wins the most politically liberal interpretation of halachic standards in the context of any peace plan out there. That means that Everyone Wins' political viability is unmatched by any other halachically acceptable peace plan over the long term. That also means that unlike a Kahane type plan, it does not require a political revolution to occur. This way of a "politically natural" redemptive process is consistent with the concept (in Isaiah 44:22) "return to me for I have (already) redeemed you." c) political viability so that the first two goals can be achieved as soon as possible. The emphasis in religion should be on morals and ethics and it all starts with the preservation of life. That is the intent of Talmudic Law. And so may it be our collective aspiration, by the grace of God. Were I a member of the Netanyahu Administration I would have voted against the building freeze in the territories. They are sending a confusing message of negotiating against their own position even before the PA regime returns to the negotiation table with them. This was only to placate a foreign power, not in pursuance of good policy for their people. The destructively self effacing courtship of friendship from the anti Jewish PA must cease so that Israel’s penchant for kindness and patience no longer be used against it by anyone. Fair play begins with being willing to play by the rules. The Israeli government’s blunder, however, has a silver lining that is found in their special treatment of East Jerusalem in the face of Western linkage of East Jerusalem with Judea and Samaria. It illustrates that they believe that the State of Israel, at least potentially, has absolute authority over the lands conquered in the defensive Six Day War, otherwise how could they assume that their annexation of East Jerusalem is valid? Thus the silver lining in the dark cloud that the Netanyahu Administration performed is that they have incidentally taken a real step in disputing those who erroneously say that U.N. resolutions 242 and 338 make lands conquered in defensive wars barred from annexation by the defensive conquerors. One of the leading foundations in the conflict over the territories is this very dispute. To briefly explain the basics of that dispute in International Law, those who argued that defensive conquest is illegal since the passage of Resolution 242 are standing upon the implicit but not explicit gist of the resolution’s wording and matters of current political expediency alone, whereas those who say defensive wars are legal means of territorial annexation cite actual historic precedents. As even an explicit law forbidding defensive conquest would only be a “customary law”, while returning strategic land to a belligerent regime would be aiding and abetting the self destruction of the innocent nation(s) who heed the implicit command of resolutions like 242, which would violate the most profound of International Norms in existence (Jus Cogens) toward their own populace. Humanity, if it is to continue to morally and ethically progress in its great journey through time, cannot bear such crimes against it. Allow me to ask you this: A man that loves his wife does not mind if she makes a few mistakes here and there. A man that hates his wife does not tolerate any wrong that she does unless he depends on her for something, whether that is for his continued prestige, care of his children, avoiding the loss of his fortune to divorce expense or the like. So what does Abbas have that makes the Netanyahu Administration desire to put up with him? If Abbas leaves, there is fear that Hamas would take over? How can they not if every time there is an election Hamas gains more and more strength? But that is not Israel’s concern. The Arab people subjugated by the PA voted for their terrorist leaders rather than less offensive third party candidates like Hanan Ashrawi’s party. Now third party alternatives will likely never again gain the attention of the Palestinian press thus solidifying the hold of the current terroristic PA configuration in perpetuity for as long as the PA will exist. You owe such voters nothing from a foreign policy aspect. Thus when forming your policy towards Palestinian Arabs only humanitarian concerns should be considered in relation to their dire political plight and bleak future if the PA should remain their masters, God forbid. Standard regime change cannot fix this problem. The regime once removed would likely be replaced by a worse regime. So what you have then is essentially an entire national entity lost to the prospect of achieving true peace through negotiation. Therefore negotiation itself has been made a mockery and even an impediment toward the pursuit of actual regional peace by the will of the Palestinian voters themselves as interpreted by their petty and corrupt leaders. Acknowledge that as long as you hope for the PA to change, there is no hope. Consider that if you annex only small portions of the West Bank, you abandon thousands of good Arab people within the PA to an endless reign of despotic rulers. It would not be compassionate to ignore their plight. Abraham asked God to spare an entire evil city if only ten good people could be found in it. Many thousands of Arabs voted against Hamas. Do they all deserve abandonment? Let’s put the answer out there plainly. Do not replace Abbas, remove him and his whole regime entirely. Annex the territories and bring democracy and peace simultaneously to the Israelis and Arabs living there. If demographic concerns still haunt, then a plan like the Everyone Wins Peace Plan can treat that even in the context of such a massive annexation by way of a staggered naturalization process. Either way, you could then have true peace and liberty for all, by the grace of God. Israeli President Shimon Peres recently said, "Those who reject the two-state solution will not bring a one-state solution. They will bring one conflict, not one state. A bloody endless conflict." Excuse me, but isn't that what the Oslo Accords accomplished? Is that not the very fruit that it brought upon Israel? Isn't that what the Roadmap to Peace (Oslo 3) ended up doing, especially before the security fence was built? Has it been so long since the first Intifada began that people have forgotten what it was like when Arab refugees didn't try to kill Israelis? Answer this: Why, when Arafat was a fugitive for the first three decades of his terroristic career, there was no intifada? Why when Arafat underwent a PR makeover and was a pseudo partner in a pseudo peace process, why then did Israel stop looking over its borders with fear, but then start looking within its borders for the most clear and present dangers? Arafat created a goon squad of terrorist abusers of the national psyche. Did anyone really believe that whitewashing the high crimes of the PLO by calling them by the designation of "diplomats" would bring Israel closer to peace? Oslo 1, Oslo 2, the Roadmap. Wrong thought processes were at play that conceived these plans, which have brought these decades of endless violence. Like a battered wife who clings to her abusive husband. She should not cower behind the locked bathroom door each night hoping for her husband to calm down. She should leave or call the police. By continuing to advocate the pursuit of a "two-state solution" you are essentially telling your people to sit there and take it; for eternity. This is peace? This is madness! Bad policy such as this hopes to placate the abuser long enough so that the victim can just be left alone for a scant few moments of respite from his limitless rage. But no practical plans for long term security are on her agenda. Taking dangerous risks without a clearly obtainable goal is a classic symptom of the faulty reasoning that often affects the thought processes of victims of abuse. For example following up Oslo 1 with Oslo 2, then Oslo 2 with the Roadmap would be an expression of this disorder at the political level. The healthier choice would have been seeking national consensus on the vital issues at play rather than forcing through the Knesset a left wing agenda. To have true freedom from bloodshed, you must first inculcate true freedom of the heart and mind. As God told Yehoshua (Joshua) repeatedly, "Be strong and courageous". Why should Arabs keep their homes and not Jews? Is this justice? Why should Israel be forced into "Auschwitz Borders" as your friend Abba Eban used to call them? Is this security? Why should you have to give anything to get peace? Should peaceful intentions not be shared by both partners? Currently only one side is committed to peace and freedom of the other side if they should reach a peace deal, while the other guys refuse to accept even the notion of a Jewish State. Is this a true path to peace? You have been strong and courageous to make sacrifices for peace. Now be strong and courageous to encourage the forsaking of the failed paths of national self destruction, leaving them as history. Only this new direction is a path that can lead to healthy and true peace. Soon may it be so, by the grace of God. As we discussed before, according to both Talmudic and International Laws, the Land of Israel is not only promised to the Jews, but legally belongs to them. So what the Secretary of State is saying is that the Obama Administration does not care what "religions" say or even what "laws" say, only what the expedient needs of its self chosen foreign policy is. Is that what she's trying to communicate or am I missing something? Reminds me of something I learned about Manifest Destiny. You make up a political ideology, and that becomes your law. Your current belief system trumps religion, history, law and common standards of fair play. Ask a Native American if that is always a good thing. Invite me to Washington and I'll explain it all to you. P.S. I only eat Kosher. Siding with Israel over Iran does not mean that it's OK to sell out American principles on peace in the Middle East. I don't mean to be pessimistic on a new administration. Generally it's good to give people a chance to get some experience and confidence going on their new job. Still, when the new kid on the block repeatedly foments controversy, it's hard to ignore what is going on. Why does it seem that every time Vice President Biden and Secretary of State Clinton make a statement in favor of Israel we need to tell ourselves to wait 24 to 48 hours until there is a retraction of some kind? There needs to be ideological consistency out the White House. You can't blame Iran for being dangerous and then turn around and support Hamas. On the matter of Iran, as said before, if there is military action against Iran, I would hope that it were by the US not Israel -not for Israel's sake, but for the well being of our troops overseas who are easier targets than anyone in the Land of Israel is. I don't care if they are holding guns, these brave soldiers are young Americans who are potentially in harm's way. America can and should protect it's own. The prime responsibility of an American President is as Commander in Chief of the military. Iran's current regime is a potential threat to many members of that military. Whereas the prime goal of foreign policy is to further national interests in a way that does not harm our allies, otherwise few trusted allies we would have, indeed. The territorial dispute in Israel should have zero to do with the foreign policy we show towards a world class dangerous regime in a different part of the Middle East. Please don't confuse the two. Every time a tough statement is made against Iran, the current practice of this White House is to make some sort of corresponding verbal slight against Israeli rights to their land. If this is a calculated choice, it would be an effort at even handedness for the sake of even handedness, in a way that is not even handed at all. Separate these two theaters of conflict within your foreign policy to prevent one large theater of war from believed intertwining interests that never existed until some foolish speech writer linked it all into a hodgepodge of pseudo even handedness and outright untruthfulness. The goal is to avoid conflict, not hasten it. Please consider that perhaps the unintended message of this methodology is speaking louder than the intended message. The enemies of civilization tend pick and choose that which they want to hear. Therefore the upholders of civilization must be more circumspect in their speech. To not lend voice to all of the tools of truth is to offer truth a pale defensive effort. To deny any aspect of truth, is to pick up the mantra of the enemy and to insanely fight with oneself over the other aspects of truth that one still remembers to use to their own merit. You have embraced the enemy's deception and called it normalcy and thus weakened your overall efforts to preserve what absolutely must be preserved. To uphold that which is known to God and humankind. To put it plainly, that Jews have an historic, legal, moral and religious right to Jerusalem. Judaism itself, in fact, depends on Jerusalem. By trying to divide either the physical Jerusalem, or the Jewish People from Jerusalem, you are violating their collective religious freedom in the most profound way possible. The Nazis tried to exterminate the Jewish race. The effort to divide Jerusalem is no less than an effort to exterminate the Jewish faith from the world. Which side of this divide does the Netanyahu Administration wish to place itself? Even as the Prime Minister said that Israel will continue to build in Jerusalem, his Intelligence Affairs Minister, Dan Meridor of Likud showed with his recent interview all that is wrong with those leaders who are insensitive to the concept of freedom to pursue one's own religion being an inalienable right. Seemingly drawing a line in the sand, Meridor said, "The Old City with the Jewish Quarter and the Wailing Wall will never be part of an Arab state; all the major Israeli parties share this conviction. There could be a compromise on land in Judea and Samaria. But all Israeli governments have agreed on having a united Jerusalem. This is our clear position, but we can negotiate about Jerusalem. There are no preconditions." ...he noted that the introduction of religion into a conflict that was historically defined on nationalistic ideas complicated matters. "It has become more difficult over the years because of the introduction of religion into this conflict. Arab rulers hated us in the past, but they did so because of nationalistic ideas. Since the  revolution in Teheran, we hear a different tune: The Iranians, Hizbullah and Hamas fight us in the name of religion. This is very bad because people can compromise, but gods never compromise." But Meridor also insisted that the issue of Jerusalem was not predicated on religion. "The previous pope (John Paul II) said that Jerusalem is sacred to all religions, but was promised to one people. We have no religious claim on Jerusalem; we have a national one. Jerusalem is our capital," he said. You just said that Iran is using a religious argument to try to take your capital out from under you. Further the anti-democratic-democratically-elected Hamas denies the plain truth of your rights, using pseudo religious terms not found in the Koran to assault your claims. In other words, if this moral debate were not a battle of religious rights before, your enemies have turned this into one. To use a parable, if rioters take to the streets to loot innocent businesses, either you match their force with law enforcement, or you tell your citizens to at least protect themselves against the looters by staying off the streets. By stating this is exclusively a secular conflict even as your enemy uses and twists religion as a tool to further their ends, you are disarming yourself before their verbal onslaught. Discapacitating your public relations at the same time as you empower their deceitful propaganda. Worse, you are disenabling dialectal pursuit of root and absolute truths. The very life preserver of moral, historic and legal rights themselves. The majority of Israelis practice religion. This means that the many poll results that Jerusalem is considered beyond abandonment to the vast majority of Israelis are certainly true. Which also means that there is no way, no philosophic construction that could be devised that would be honestly conducive to democratic ideals that would allow the United States of America to support the separation of Jerusalem from Israel, the abrogation of the Jewish faith itself, with any shred of moral clarity or justification. If today you will try to abolish Judaism, is not the obliteration of Christianity on your agenda for the morrow? Rather than trying to exploit any ideological weakness it can find in those few confused Israeli leaders who believe in whatever current U.S. policy happens to be, the U.S. Administration should be encouraging true democratic representation within Israeli's own government and policy making. At least that's what a true friend of Israel and bastion of democracy would do. A call to a more hybridized political thought process on the Middle East Conflict would serve to sooner end it. By awarding the Presidential Medal of Freedom to pro-violence and anti Israel Mary Robinson, the Obama Administration has found a way to not only continue to aggravate pro-Israel Jews and Christians, but has made perhaps an unintentional but seriously flawed declaration that the ways of violent protests of Yasir Arafat trumps the non violent path of Martin Luther King Jr. Besides the broad implications this may have for domestic politics and the dire consequences for Democrats to keep their majorities in congress come the next election cycle should they be viewed as anti-King, this immediately and negatively effects American influence in the Middle East. This can only lend further extremes to future Palestinian Leadership demands and complicate the impossibly difficult situation between Israel and the PA beyond repair. While I would applaud an end to the wrong minded Roadmap to Peace, it should not be done in this way. First the reversal on Jerusalem. Next the heavy handed interference on the matter of internal Israeli infrastructure policy that was never explicitly forbidden and signed upon in the Roadmap. Now the Administration can be viewed as implicitly rubber stamping future PA sponsored violence against Israel, let alone whatever good intentions that may have been in play during this Robinson decision. Will supporters of terror look at the President's unstated intentions or his explicit actions to justify their evil plans? If the President does not retract his decision entirely, which is the preferred option, then I would suggest that clarification should issue from the White House that support for any anti-King philosophy that Robinson may hold was not intended and is virulently rejected by this administration. Three such faux pas in a row is not just a bad sign, it is a diplomatic disaster than needs some cleanup work to be done as soon as possible. A couple years ago I wrote that there could be a lot of political Goodwill to be gained with Israel by granting freedom to Jonathan Pollard, and no significant political downside to releasing him. President Bush rejected this opportunity, but perhaps President Obama will not. Perhaps this can be the political life preserver that Democrats need to show they are not the Anti-Israel party of the United States of America. Come the next election cycle, the Democrats could spin that it wasn't a Republican President who had mercy on a man incarcerated for 24 years, it was a Democrat. Conversely, it could be that what may be remembered at the next election cycle will be instead that every year, month, week and day that passes with undeserving fools like Robinson getting awards, while the humanitarian plight of Pollard is ignored as he is left to rot in prison. What will the President choose to do? Bringing peace to nations is not a game. So why are the Roadmap Nations treating it as such? As if they can make up "house rules" of diplomacy where you can discriminate against the nation of your choice regardless of what objective norms (International Laws) say on the matter. The new USA objection is due to concern over potentially prejudging the final outcome of a negotiated settlement. But in actuality, all that happened was not a political decision, but a decision in a court case between private litigants. To connect a court ruling on a decade old case with any future negotiation is a ludicrous suggestion at face value. No one at the signing of the Roadmap back in 2003 would ever have expected future court cases to be decided even before final status negotiations have taken place. To suggest that is to state fiction. I start to worry where we are headed as a nation when our Foreign Affairs officials state current policy and call it International Law, when it is not. Until now the Obama Administration has been far from even handed in its treatment of Israel. But if its "experts" continue to misstate plain facts so grossly that they are viewed as either fools or liars not just by opposition political forces, but even mainstream members of foreign Parliaments, then the USA's influence in the Middle East will wane and erode along with it the hopes of participating in the bringing of true peace to the Middle East in the near future. Participating. That word is key. It implies a certain level of humility that current USA foreign policy lacks towards our best friend in the Middle East, Israel. The court ruled that illegal housing was built on private property. In cases where the property owners were not Arabic, there was no previous protestation of the many prior decisions of the Israeli courts. In the United States, a State Department spokesman urged Israel to refrain from "provocative actions." "As Secretary [of State Hillary] Clinton has stated previously, the eviction of families and demolition of homes in East Jerusalem is not in keeping with Israeli obligations under the Roadmap," said Robert Wood, referring to the 2003 "Roadmap for peace" plan. "We urge that the government of Israel and municipal officials refrain from provocative actions in East Jerusalem, including home demolitions and evictions. Unilateral actions taken by either party cannot prejudge the outcome of negotiations and will not be recognized by the international community." If any nation is discouraged from heeding its own courts because it is not preferred by other nations, would any nation listen to this? How about those non-democratic countries that are dismembering their own citizens due to highly questionable court decisions? Where is the condemnation? What if another nation tried to threaten America IN ANYWAY for a ruling of an American court of justice? Would, COULD, America ever dare give in to such meddling? It would undermine the whole justice system to do so, and therefore it is unreasonable and ridiculous to even suggest such a thing. This is not a matter of even-handedness or not. It is a process toward making a mockery of objective truth and justice and therefore such a path is antithetical to the American Way. Worse it shows that America no longer cares about how it looks in the eyes of her allies. That is diplomacy gone astray. The greatest threat to the Roadmap to Peace is not an Israeli judge, but current American Foreign Policy! Even as a critic of the false Roadmap to Peace I do not glory in this path to failure through an overdose of self contempt. A hog enjoys playing in the mud, but a diplomat should not. The Roadmap nations need to respect themselves more by either speaking more truthful statements from now on, or getting out of the game. Perhaps I am understating the intensity of my objection to his current plan, but presumably Prime Minister Netanyahu intends to elucidate further details of his plan, assuming the Palestinian leadership even comes to the table. Still I do not wish to remain silent when perhaps my inaction could contribute to the evil that could come should the plan be implemented in its current form due to the diminishment of IDF authority in keeping the peace. The Israeli press celebrates, a new day has dawned now that the Palestinians have signed away the right to complain about further land concessions. Then the mayor of (a small town in the West Bank) objects to the Palestinian Authority's renunciation of rights to Jerusalem and Tel Aviv, and he leads an open rebellion against Israel, encouraging terrorist groups to use his town as a safe haven. The PA police claim they do not have strong enough weapons to put down the violence. The Israeli Defense Ministry claims that the PA does have enough weapons. After the violence escalates, the Israeli government authorizes military action. Several Arab states protest Israel's attack on the "defenseless (by law) Palestinians civilians". (Since the PM's plan calls for a demilitarized PA, technically, all West Bank Palestinians would remain civilians, whether or not they are part of an authorized militia.) Resolutions are brought forth at the United Nations and pass against the aggressive Israeli ("over")reaction. Problem: Now, as a full fledged state, Palestinians have FULL member status and rights in the U.N.
Arabs states feel more empowered to act against Israel militarily in order to "enforce the law". Result: The threat of war is increased, if not guaranteed by implementation of the PM's plan in its current form. This is just one potential work-around by foes of Israel to such a shared security plan. The only solution can be one in which the IDF retains absolute authority and at the same time the concept of Palestinian terrorists being "defenseless civilians" rather than the worst of criminals, is completely removed from the table. 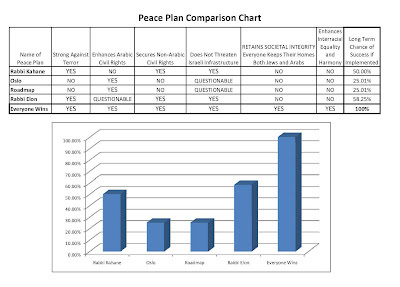 The Everyone Wins peace plan, for example, is consistent with such an ideal resolution. So this aspect of the PM's plan still needs some editing before being used in actual practice. Even those that were previously threatened by Iran should feel compassion towards the terror and bloodshed of recent days. The Iranian leadership has only proven that they do not speak for God, as their disregard for the respect due towards the hallowed "Likeness of God" (tzelem Elokim) that is found in each human being, is so complete, that they even brutalize their own citizens. May God protect the righteous of the world from the bloodthirsty and soon bring true peace to every land. The Roadmap to Peace that the new administrations in the USA and Israel currently seem to believe as still containing merit, is, in fact, already dead. The Benjamin Netanyahu of a decade ago would ask, where is there hope of reciprocity in this path with these pseudo partners in peace? Because Fatah still embraces Hamas, and Hamas is an unrepentant terror organization, the current Palestinian Authority leadership is nothing but a pure continuation of the PLO of old. It is exasperating to consider the current diplomatic intentions of both countries. The path to false peace is when political leaders of nations become lovers of advancing diplomatic processes in the general realm of peacemaking rather than gaining true and substantial achievements in the realm of actual peace. The entire intent of International Law is to PREVENT CONFLICT between nations, not to enshrine an eternal state of war with pretend legitimacy. You cannot say that because the U.N. Security Council supports a path that leads to war and calls it peace, that it is now a legitimate peace plan and indeed consecrated as International Law itself. Nothing could be further from the truth. A treaty between nations cannot include the suicide of one of those nations. That would violate Fundamental Law (Jus Cogens). For example, when American demanded an unconditional surrender of Nazi Germany in 1945, that did not grant the USA a right to commit genocide against the Germans once they surrendered. If the roles had been reversed and the USA had to surrender to the Nazis. And the USA knew for a fact that Nazi Germany would only slaughter USA citizens if the USA surrendered, then such a document of surrender would be a violation of the Jus Cogens of the citizens of the USA. Similarly, if a peace treaty were to be signed with any ACTIVE enemy of Israel by any government of Israel that Israel should surrender land to it, and/or if a U.N. Security Council Resolution were to call such a peace treaty absolute law, the treaty would STILL remain invalid, because it would be predicated upon an implicit and highly credible assumption of impending violation of Jus Cogens. Allow me to clarify that my intent is not to attack PM Netanyahu with abandon. I have confidence that he can come to the correct conclusions on his own without my having said anything. I feel that all he needs is a few days, weeks or months to reacquaint himself with the Palestinian leadership for him to come to the same realization that I am at. What I am trying to do by speaking about this now is to help breakdown the false philosophy of those political opposition forces that are trying to encourage him to make extremely unwise and unhealthy choices for his constituency, and what negative implications that would mean for the national security of both Israel and the USA if, God forbid, he heeded their advice, which again, at the end of the day I hope and feel that he won't. Hamas believes it is entirely legitimate to attack Israeli civilians whenever it pleases. Fatah passively supports Hamas. And even if you want to say that Hamas can be dealt with and Israel can simply sign a peace deal with Fatah, then I would remind you that Fatah itself is still truly a terrorist organization, whether or not it is currently politically expedient to admit that as the national foreign policy of the USA and Israel. If you disagree with me then please forgive me if I pain you with the use of logic. If even now Fatah is not committed to ending terror, then how can they ever be trusted to do so? If even now Fatah is not against Hamas, when the Palestinian leaders of Fatah are supposedly with their backs to the wall and suffering greatly, and have the Israeli army almost at their beck and call to wipe out Hamas, or at least eliminate the main terror cells within Hamas controlled territory so that Fatah could rule peacefully. If even now Fatah is not committed against terror, then they can never be expected to police against future terror groups that may arise to demand 100% of the land of Israel from the Israelis. Thus any peace deal signed with FATAH, not just Hamas, would be invalid from the get go as such a deal would be predicated upon an implicit and highly credible assumption of impending violation of Jus Cogens of the people of Israel. The Quartet sponsored, and current foreign policy of the USA and Israel is the "Roadmap to Peace". But all these governments have thus far backed a losing horse. If you need to gamble with the safety of the citizens of Israel, how about at least putting your money on a pony that can win? But one thing is certain, the Roadmap to Peace is an Invalid Roadmap. Due to the fact that, by the grace of God, this blog has reached the 50 post milestone (this entry being post number 51) and many of the older posts may be needed by those researching the Everyone Wins Peace Plan, it occurred to me that a table of contents may be needed. Whereas previously I only advertised on the the Internet for this blog, as of this month I am now running an ad in an upcoming edition of Viewpoint magazine. So our readership numbers may greatly increase and some of the new readers may not be used to "reading backwards" in the reversed chronological order of your average blog entry. A true peace plan should create peace first inside and then out, not outside and then in. As we find in the Kaddish prayer “He who makes peace in His Heights should make peace between us and upon all Yisrael.” Why do the Rabbis of the Talmud place “we”, i.e. societal peace, before “all Yisrael” i.e. national peace? One would have thought that if we achieve external and global peace, we would instantly have Heaven on Earth even in private matters. But the Rabbis are teaching us an important lesson. Only once societal peace is assured, then can world peace be sure to follow. Using this lens let’s look at what would have happened at the societal level if the Oslo Accords would have been successful. The left would have rejoiced as the right wing mourned. Now let’s consider what if the right wing had succeeded with a Kahane type plan. The right would have rejoiced as the left wing mourned. In either scenario only one side wins and perforce the other side MUST lose. This is akin to the battle for property in the West Bank. The extreme Left wishes to make the West Bank Jews homeless, while the extreme Right wishes to make the West Bank Arabs homeless (the kinder and gentler Israeli Initiative Peace Plan wishes them to relocate their homes to the Kingdom of Jordan, but as far as the Arab’s current homes go, it is similar in effect as the Kahane plan). In either scenario again we find only one side can win and perforce the other side MUST lose. But this is why peace has been elusive in the Middle East. The truth path to peace is not an economic equation. Its calculus should not and cannot be determined in mere economic terms of victor and vanquished. Its methodology is rather found in compromise, and not in seeking absolute terms. The Everyone Wins Peace Plan is such a true peace plan. The right can rejoice that the Everyone Wins Peace Plan secures an end to terrorist armies within a stone's throw of Israeli cities, it allows settlers to keep their homes, it also maintains the State's control over all the land and resources West of the Jordan River, and it guarantees freedom of religion to non-Muslims. The left can rejoice that the Everyone Wins Peace Plan maintains West Bank and Gaza Palestinian Arabic control of their cities and allows the retention of their homes, it also frees them short term from terrorist police and long term from refugee camps, and it eventually allows them to join their cousins within the Green Line by having a right to vote in the State of Israel. Everyone will rejoice that the Everyone Wins Peace Plan will put an end to the unhealthy segregationist environment that both sides are currently caught up in. The Everyone Wins Peace Plan also removes the main pan-Arabic excuse to discriminate financially against the State of Israel. This will only snowball the effectiveness of the plan at ending the conflict that much sooner, as improved finances and security means increased Jewish immigration rates which allows the expansion of the Arabic naturalization process that is at the core of this solution. The political right wing of Israel needs to settle on a viable path to peace as soon as possible. The ideas that the left has offered so far have been nothing more than Roadmaps to roadblocks. If the Right can find a workable solution to the decades old quagmire, then, considering the current political environment, they are primed to be able to build the political consensus needed to implement such a plan. Which would seem to indicate that the messiah can come even without a physical war of Gog and Magog (as was foretold in Ezekiel chapters 38 & 39). If this interpretation is true, then to avoid seeking a peace plan and waiting for a War of Armageddon as a geo-political fix-all would violate the commandment of “Do not stand idly by the blood of your neighbor.” (Leviticus 19.16) Therefore the theoretical vehicle towards peace that we use must resolve not only all major secular issues it must also not preclude the resolution of religious ideals as well. It must be pragmatic and yet prophecy-friendly as well. Only in this way can Israeli Jew and Gentile, Arab and Bedouin, Religious and Secular achieve a lasting and secure peace that not only prevents external threats, but serves to heal internal trans-societal rifts. Rabbi Benny Elon’s Israeli Initiative peace plan does not end false accusations against Israel of Arabic land grabbing, but the Everyone Wins Peace Plan does. In fact, any Kahane type plan, that seeks to toss out all Arabs from the West Bank and Gaza, that is not implemented only following a massive, map changing war, would not likely serve to eliminate false accusations against Israel, but would likely, Heaven forefend, only increase such slander and libel. We need to work towards bringing forth a peace plan that resolves all the problems at once, and yet does not depend on an apocalyptic war to smooth out any ruffled feathers that may remain when all is said and done. By implementing the principles of the Everyone Wins Peace Plan the Israeli government can find a single and straight path towards secular redemption and the requisite freedom for its citizens to choose to pursue religious salvation. As I mentioned before, however, should any peace plan that does not surrender Jewish holy sites be enacted before my peace plan could be, we should support it wholeheartedly, and not pursue the Everyone Wins Peace Plan as the better policy for the State of Israel. Life must come before anybody’s personal honor, so let me be clear on this point to any and all readers, students or fans of mine who end up in positions of power with the capacity to help implement “Everyone Wins” in actual practice. “Everyone Wins” should not be used as a hammer or an anvil to create headaches for the government of Israel. In such a case we should help the Israeli hasbara movement and help explain that true peace is good, however bumpy the road is. Practical good-peace is better than theoretically perfect-peace. For if peace is not in the realm of actuality then it is not true peace. But if Israel should find itself in a new peace venture that does not lead to peace, then we must definitely be prepared to shout out loud and clear in support of the peace plan that seems to be the most consistent with the will of God and the needs of humankind, no matter how simple its author may be. In order to fully represent the religious concerns of all Jews the world over for the continued free access to holy sites throughout the West Bank and especially enhancing freedom of worship at the Temple Mount, the religious parties must unite to offer one loud and clear voice that accurately expresses worldwide Jewish religious aspirations, rather than through many small voices that sometimes are at odds with each other, asking for things that appear to be at the polar opposite of the other party. First on the Rabbinical level, a Bais Din (rabbinical court) of 5 or most likely 7 of the most premiere politically outspoken and heeded sages should formed. Each of these rabbis would then select an alternate rabbi to fill in for themselves if they are unable to continue in their duties. This advisory council of rabbis will increase the collective power of rabbinical thought, even through their surrendering of the great deal of individual power that they currently hold over their respective parties. Having this bais din of rabbis will mitigate libel (loshon hora) against individual rabbis, as it will be perceived that it is the Torah itself that is speaking, not any one person with any single agenda. The perceived agenda would then be Hashem/God's will alone. Imagine the sanctification of God's Holy Name (Kiddush Hashem)! Second, all parties that revere the advice of the rabbis should unite into a single party. This small council of rabbis will replace the large body of less renown rabbinical advisers who currently offer direction. All those current rabbis and members of all the parties involved in this United Religious Party will instead hold a single conference to vote on political advice to give to the executive bais din of 5 to 7 gedolim (great sages) mentioned above. Except for those great rabbis on the executive bais din, all members of such a conference should run according to the concept of one man, one vote. But the lone communication point to the members of Knesset should be via the executive bais din. A single voice, a single direction. Third, the political leaders chosen to become members of Knesset should still be chosen by the will of the people, the executive bais din should have the right to veto a candidate's eligibility (which would take place quietly, before the votes of the party voters are cast). An announcement can be made before the vote of people who have decided at the last minute to not run after all (whether truthfully it is of their will or of the bais din's command will not be disclosed) which would be a nice way to exclude those that the bais din has rejected without embarrassing anyone in public. Fourth, the candidates must be trustworthy and trusted. Trustworthy to do the will of the people and bais din, trusted to act without consent of even the executive bais din if national security, timely diplomacy, natural disasters or other such pressing matters preclude their taking the time to inquire of the most preferred methodology as per wishes of Bais Din. Every party has its own bias. If Judaic religious freedom is to have the most effective advocacy, which is the very reason I started this blog in the first place, then it needs its own party to represent it. A party should not just be a clique that represents a single stream of constituents, rather it should be a representative body for all the people. All the people in this case, are all the religious people. Therefore the religious party of the State of Israel must be a religious party for all the religious Jewish people.